The declaration by Bradley Folb, a principal of Paramount Contractors, Inc. came in a lawsuit filed against the city by the company, which owns buildings at 6464 and 6565 Sunset Blvd. Folb says that he met in 2006 with City Council President Eric Garcetti and officials of the Community Redevelopment Agency (CRA) in an attempt to find a way to legalize multi-story wall wraps that had been cited for violating the city’s ban on supergraphic signs. Folb said he was told by Kipp Rudd, a senior planner at the CRA, that the signs could be permitted if he agreed to pay $1.3 million in cash fees, and allowed the city to collect revenue at night from the buildings’ parking lots, an amount Folb said would be at least $150,000 a year for the 10-year period demanded by the city. Folb complained in his declaration that the proposed fees were excessive and unfair, and Paramount Contractors declined the proposed agreement, soon afterward filing the lawsuit in federal court challenging the city’s right to prohibit the signs. How was the city able to make an offer to legalize signs that had been cited for violating the ban on supergraphics? That ban, adopted in 2002, allowed exceptions in sign districts, specific plan areas, and approved development agreements. The two Sunset Blvd. buildings are in both the Hollywood sign district and the Hollywood redevelopment area, which means that the CRA is empowered to make agreements with property owners on matters regarding development, including signage. Such agreements, which have allowed supergraphic signs on otherproperties in Hollywood, are typically for new developments and rehabbed buildings in areas designated as blighted, with the signage justified as helping developers and property owners finance those projects. However, the two Sunset Blvd. buildings were both built in the late Sixties, and neither was considered blighted. In August of 2008, a federal court judge ruled in the lawsuit that the city was within its rights to ban the signs. Paramount Contractors appealed that decision to the 9th Circuit Court of Appeals, and a ruling is pending. In addition, the company filed a new federal court lawsuit on various constitutional grounds, but the judge stayed any further action until the 9th Circuit rules in the case of World Wide Rush v. City of Los Angeles, which will ostensibly determine whether of not the city’s much-challenged off-site sign ban is constitutional. The suit filed last week in L.A. County Superior Court by City Attorney Carmen Trutanich asks for fines of $2,500 a day plus revenue collected from the unpermitted signs, an amount that could run into the millions. 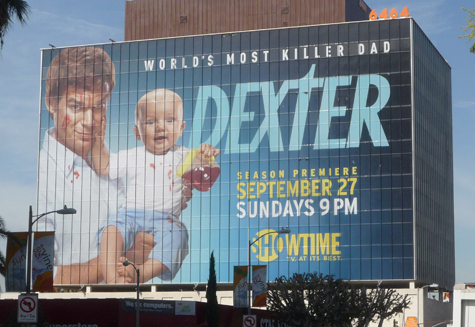 The suit also names Vanguard Outdoor Advertising, the company that put up the supergraphics on the Sunset Blvd. buildings, as well as several other buildings in the city.